Between Corinaldo and Senigallia, Tre Castelli Farmhouse is a typical farmhouse of the region Marche in the green countryside, easily accessible by a comfortable paved road and a short section of a country road. 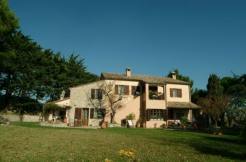 It is located in a discreet and quiet position upon the gentle hills around Senigallia, this farmhouse overlooks the valley facing south, with a swimming pool that invites refreshment during hot summer days before having lunch under the pretty porch overlooking the garden. It is an elegant and well-designed farmhouse, surrounded by a luxuriant vegetation; many white roses frame the swimming pool and solarium area, tall trees shade the areas around the house, the lawns are well kept. There is also a well. The swimming pool is 13 meters x 5 meters. Its rectangular shape is extremely spectacular with a stairway leading into the water. One of those places where you would always remain not only for the refined hospitality but also because you can feel in the right place. You are among the castles around Senigallia, which turn red during summer evenings, because of a refraction effect of the local typical bricks that cover the ancient walls. The old towns brighten with cafes and trattorias where you can eat in the open air, in the typical spirit of the people of the region Marche, the real keepers of Italian food traditions. Surrounding hills are drenched in colors and chiaroscuros of trees design indefinite shapes on the moats’ edge, disturbing the monotonous yellow and ocher of the summer landscape. The house really fits this countryside, the Senigallia area has a particular light, between the sea and the mountains of the Arcevia area, it takes every hue of this generous land, that nobody has ever abandoned, a loving and beloved land. Tre Castelli Farmhouse was well built and on two floors. It is covered in bricks and plaster, windows with wooden frames and the roof is covered with typical roof tiles and thermal insulation system. It was built in accordance to strict earthquake proof regulations in force. On the ground floor the living area: study room, sitting room with a large fireplace, porch, the dining room, and the comfortable and handy kitchen, and then the bathroom. On the first floor, there are four bedrooms and two bathrooms. double glazed windows, Cotto tiles, heating system. Every detail was specifically chosen and nothing was left to chance. Public water, electricity, and LPG. A near town is 1 km far, where you can find a supermarket, pharmacy, post office, and bank.